Explore a little farther out and you will discover Sarasota's beautiful keys, some of which are bustling with well-equipped beaches and attractions, others more remote and serene. Longboat and Siesta keys attractions close to Sarasota fit the former description, while Anna Maria Island fits the latter. Farther afield again is another of the region's delights, the intriguing Gamble Plantation. 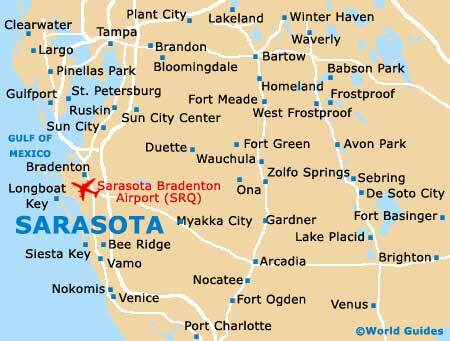 Continuing north of Sarasota is busy Tampa, while northeast is Orlando, where Disney World's attractions await. 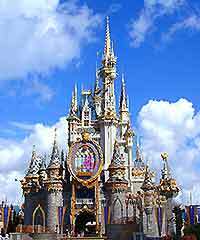 With Orlando only a two-hour drive northeast of Sarasota, it would be a shame to visit the area without taking a look at the theme park capital of the world, especially if you have kids. Home to the likes of Disney World, the Epcot Center and Wet-'n'-Wild water park attractions, you are virtually guaranteed a great day out. The various parks work out as fairly expensive for all the family, but you can easily spend a complete day here without breaking the surface and there will be no time to get bored. 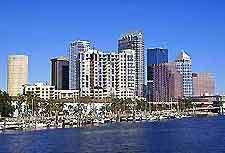 Lying about an hour north of Sarasota, Tampa is the main city on the west coast of Florida and is well developed with numerous attractions for the whole family. It is worth the drive here from Sarasota just to see the magnificent new art museum that is devoted to master painter Salvador Dali, while the Florida Aquarium is one of the best in the state. The city also delivers at nighttime, with its massive choice of seafood restaurants, bars and clubs. Located above Longboat Key and opposite Bradenton is Anna Maria Island, a great place nearby Sarasota, offering piece and quiet and spectacular beaches. Visitors are drawn to Anna Maria Island by its wonderful, unobstructed Gulf views and slow pace of life. There are no high-rise buildings here or monstrous shopping malls and the best way to explore the island's attractions is to hop aboard the Manatee Trolley. 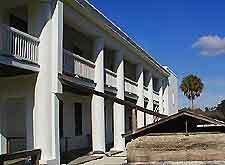 Located to the northeast of Sarasota in the town of Bradenton, the 1840s construction known as Gamble Plantation is the oldest building along Florida's southwest coast. One of the best examples in the country of an antebellum plantation home, the building has 10 rooms and was put together with a mortar mix of sand, oyster shells and water. Exterior attractions include numerous columns and three verandahs, while inside are eight fireplaces and 19th century furnishings. 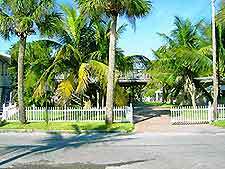 South Lido Park is situated at the southern tip of Longboat Key and the bathing opportunities here on the magnificent beach and in the park are superb. Sugar-sand beach is one of the southwest's best beaches, while park attractions here include nature trails, a playground, volleyball court and picnic grounds.